Regular sessions of cardiovascular exercise are essential for long-term weight loss. Not only does it burn calories, cardio also improves your health and function. The elliptical trainer is a popular piece of cardio equipment that is low-impact but offers a high-intensity workout. In one hour, a 160-pound person can burn up to 825 calories. To lose 1 pound of body fat, you need to burn an extra 3,500 calories. Losing 1 to 2 pounds per week, you can lose 20 pounds using the elliptical in as little as 10 weeks. See your doctor before beginning a new weight loss program or exercise plan. Perform elliptical workouts five to seven days per week for significant weight loss of 20 pounds or more. Daily exercise sessions are advised to see the best results, according to the American College of Sports Medicine. Exercise at a moderate to high intensity during each elliptical workout. There is a positive correlation between heart rate, intensity and calories burned. It is okay to start at a light to moderate intensity if you are new to exercise. But gradually increase your intensity for the best results. Build up until each session on the elliptical lasts 30 to 60 minutes. If you are new to exercise, start with three 10-minute sessions each day. You will burn calories and gradually increase your endurance for maximum weight loss. Try different programs on the elliptical, and vary your pace and resistance. If you always do the same workout, your body will become accustomed to the exercise and slow down your progress. Incorporate high-intensity interval training into your elliptical workouts. Warm up for five to 10 minutes at a moderate pace. Increase resistance, pace and/or incline to a very high intensity for 30 to 90 seconds. Bring back to a moderate intensity for one to three minutes. Alternate high and moderate intensity for the duration of your workout for increased weight loss. Start slowly and gradually build frequency, intensity and duration. Plan to lose 1 to 2 pounds per week for long-term weight loss. Consider adding other forms of cardiovascular exercise to prevent a weight-loss plateau. Add two days of resistance training per week. Eat a healthy balance of carbohydrates, protein and fat. Stop exercise immediately if you feel pain, dizzy, lightheaded or nauseous. Do not expect results overnight. It will take time to lose weight. 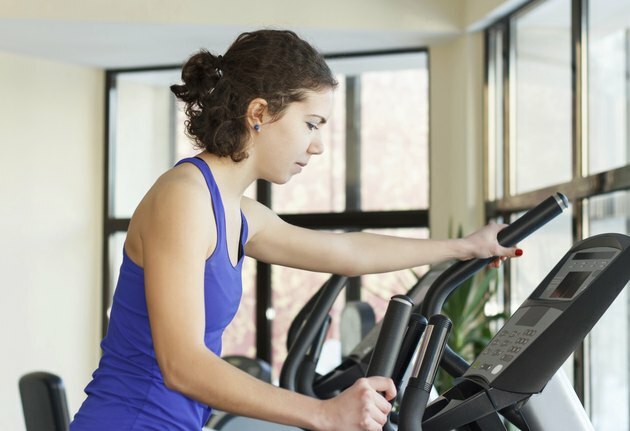 Avoid doing the same workout all the time on the elliptical. American Council on Exercise: What Is High-Intensity Interval Training and What Are the Benefits? How Many Hours Does It Take on a Rowing Machine to Lose Weight? What Cardio Machines Slim Your Waist?